The main seminar theme that resonated with my work and that really got me thinking is that of “occupation.” First of all, what does it mean for a place like the refugee camp, more specifically the Palestinian refugee camp, to be occupied? When we think about Palestinians in relation to occupation, the most obvious image that comes to mind is that of the Occupied Territories (the West Bank, Gaza, and East Jerusalem). However, Israeli military occupation, and linked to it settler colonialism, are not the only realities through which one can understand Palestinian space as occupied space. In my book manuscript, I examine why UNRWA’s (United Nations Relief and Works Agency for Palestine Refugees in the Near East) introduction of the discourse of “sustainable development” into the refugee camps of Ein el Tal and Neirab in Syria proved to be a controversial issue and a source of tension between Palestinian refugees and the agency. 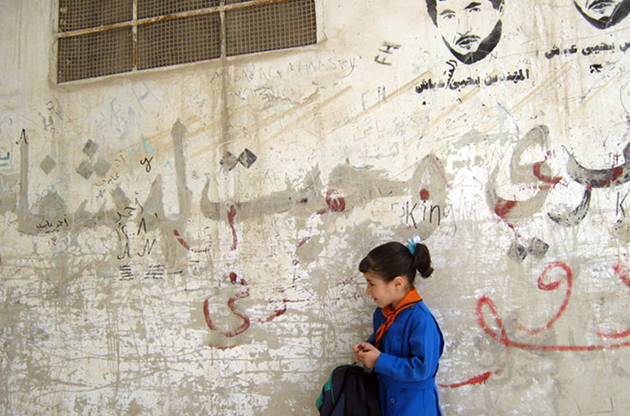 I argue that, while not resisting development per se, Palestinian refugees were resisting UNRWA’s development narrative presented as a story of progress that entailed refugees moving away from “dependence on assistance” toward “self-reliance.” Ein el Tal and Neirab can be seen as spaces that are occupied by the dominant narrative of UNRWA-sponsored development. Palestinian refugees, while not rejecting this narrative of development outright, insisted on development being incorporated into an overarching story of progress that begins with their forced displacement from their Palestinian towns and villages in 1948 and ends with Israeli implementation of their internationally recognized right of return to their Palestinian homes. According to one variant of this narrative, development is about empowering oneself, becoming resilient in the face of social hardship, so that more energy can be devoted to the political project of return. The part of the seminar discussion that I am still grappling with has to do with the differentiation between occupation and demonstration. I would like to add a third category, “protest.” I wonder if these three terms can be fully dissociated from one another and in what way it is useful to contrast them. This topic was part of the discussion that arose after the panel on “privatization and neoliberal logics.” The discussion focused mostly on the distinction between occupation and demonstration. According to Ghassan Hage and Ackbar Abbas, a feature of occupation is that it doesn’t presuppose any demands and therefore doesn’t recognize any authority. Ackbar Abbas contrasted “demonstration” to occupation arguing that “demonstration” is about “making a demand of authority” and that this is a demand “that can be granted or not.” As far as I’m concerned, “protest” includes both “occupation” and demonstration.” For me, Tahrir and the Occupy movement that swept many American and European cities are a form of protest but this form of protest is not new. In the seminar some pointed to Hizbollah using occupation as a form of protest a few years ago. That is something I was unaware of, but for me, before Tahrir, Occupy, and Hizbollah, there was the Palestinian refugee camp. Someone asked, during one of our group discussions, who held the record for the longest occupation of a space as a means of protest. I believe Palestinian refugee camps are definitely contenders in that respect. Of course the Palestinian refugee camp has its specificities. Unlike Tahrir or Zucotti, Palestinians did not willingly march to their camps. If anything, they were marched into them and protest certainly was not the initial role for which the camps were set up. But Palestinians have, over the years, transformed their camps into spaces of protest. To understand, in part, why issues having to do with changing, modifying, and “developing” the landscape of the camp have been controversial, it is imperative to recognize that the camps embody an ethos of protest. Like Tahrir or the tent encampments of Zucotti, the camps have to stand out, they have to be visible, they have to interrupt the dominant narrative of everyday life, they have to signal a problem, a problem that cannot be ignored, and won’t just go away. That is why, within the context of my research, it is important that despite infrastructural improvements, the camp “continue to look like a camp,” that it not become indistinguishable from the space of the city. In contrast to what was said during discussion, I wouldn’t completely separate occupation from demonstration by saying that occupation doesn’t make any demands while demonstration does. I would nuance this a bit by saying that the main goal of occupation is to interrupt the present and demand attention but once attention is given I don’t see how demands would not follow. It also seems to me that demands, even if not clearly articulated, are a catalyst for occupation (to me there is a demand implied in the statement “We are the 99%”). Finally, it is not clear to me that occupation does not recognize authority. It seems to me that there was a dialogue going on between the protesters in Tahrir and the government, culminating in the announcement by the army that Mubarak had stepped down. With regard to “demonstration” perhaps you could say that demonstration rests on a set of clearly formulated demands that presuppose a recognition of authority from the outset. This is the case especially when it comes to authorized demonstrations. But what about unauthorized or spontaneous demonstrations? Do they necessarily involve a clear set of demands or a recognition of authority? What about riots (for example the LA riots in the aftermath of the Rodney King beating), or are riots in their own separate category? The arguments made in the seminar that “demonstration” implies movement while occupation does not, that “demonstration” implies demands while “occupation” does not, also raise the following questions: did the protesters in Tahrir not march to occupy the square (some going back and forth daily)? Wasn’t the occupation of Zucotti Park preceded and supplemented by marches on Wall Street? When Palestinian refugees demonstrated by marching to the Israeli border in May 2011, was that the first time that they were demanding the implementation of their right of return? On a certain level, couldn’t the occupation of the space of the refugee camp, for more than 60 years after being forcibly displaced, in itself be seen as a demand for Israeli recognition and implementation of the right of return? Would paying attention to temporality help answer these questions and offer a more complex understanding of the relationship between protest, demonstration, and occupation?